Isaiah Harris of the United States, pictured during the 2017 World Athletics Championships in London. The decision to turn professional over the weekend was a relatively easy one for Lewiston native Isaiah Harris. Recently removed from winning the NCAA Division I championship in the 800-meter run, the Penn State junior had little left to accomplish in the college ranks. “I definitely wanted to check that off in my collegiate career, to be a national champion, because that’s difficult to do,” Harris said during a Sunday press conference after finishing second in the 800 at the USA Track and Field outdoor championships at Drake Stadium in Des Moines, Iowa. “It’s just as hard as winning a USA championship, sometimes harder (because of the international competition at the college level). Harris has signed with Nike and the Tennessee-based Flynn Sports Management and ran Saturday’s race wearing a Nike singlet for the first time. The 21-year-old Harris leaves the amateur ranks as one of the most nation’s most gifted young middle-distance runners, a roster that includes the winner of Saturday’s USATF 800-meter run, 23-year-old Clayton Murphy of New Paris, Ohio. Harris’ resume includes back-to-back runner-up finishes in the 800 at the U.S. championships as well as his NCAA title at 800 meters outdoors earlier this month. He finished second at the same distance at the 2018 NCAA indoor championships. Harris also placed sixth in the 800 at the 2016 U.S. Olympic Trials and reached the semifinals at the 2017 world championships. That followed a stellar career at Lewiston High School where he won three Class A state championships at 800 meters, two in the 200 dash and one in the 1,600. He won all three of those events, as well as being part of his team’s first-place 4×400-meter relay team, as a senior at the 2015 Class A state meet. Harris was a two-time New England champion in the 800, and capped off his high school days with a third-place finish in that event at the New Balance outdoor national championships. Harris also was the runner-up as a senior in the Class A cross country state championship meet and played basketball for the Blue Devils during the winter. 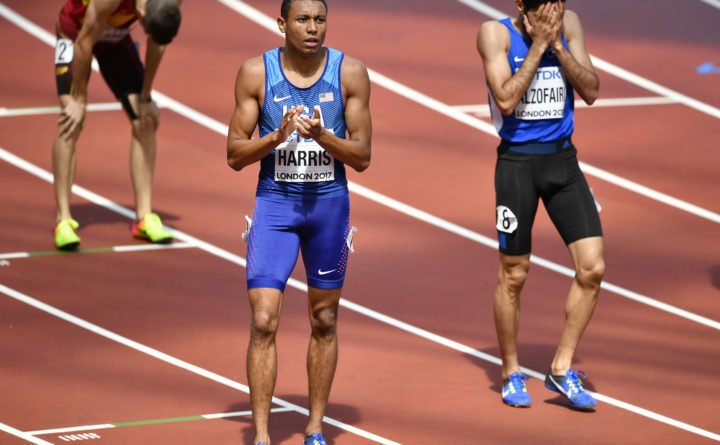 In Saturday’s USATF final, Harris took a brief lead over Murphy with 200 meters remaining before the 2016 Olympic bronze medalist surged ahead for the victory in 1 minute, 46.50 seconds. Harris plans to remain at Penn State to earn his bachelor’s degree and continue his training under Nittany Lions’ head cross country and track and field coach John Gondak. “I don’t see a reason to change things up when I know it works,” Harris said. Harris said turning pro will allow him to challenge himself against stiffer competition in advance of next year’s world championships and his pursuit of an Olympic berth in 2020. “I think I was just ready for more competitive meets and to get to some Diamond (League international) meets and prepare for the world championships that are a lot later next year (Sept. 28-Oct. 6, 2019) as opposed to 30-something races in college,” he said.